The Real Art of Latte – Our Baristas Milking a Cow? On Tuesday, we closed Tazza D’Oro early for “staff training”. However, this training didn’t have anything to do with coffee or the espresso machine. Tuesday’s training was about appreciation, connection and what I call the “real” art of latte. Back in September, during local food week, we hosted Nicholas Yon from Turner Dairy and one of our local dairy farmers, Mary Stoner. Mary and her husband Sam, own Stoner’s Dairy Farm in Latrobe. The Stoner Farm supplies exceptional milk to Turner Dairy – because of this quality and the local connection, we purchase all of our milk from Turner Dairy. Mary and I made arrangements for the baristas of Tazza D’Oro to visit the farm and have the chance to experience and see all the work that goes into getting milk from the farm to Turner Dairy and finally to Tazza D’Oro. Our baristas had the chance to meet all the exceptionally well cared for cows, “hook them up” for milking, ask a bazillion questions and spend a few hours walking in the boots of our farmers. 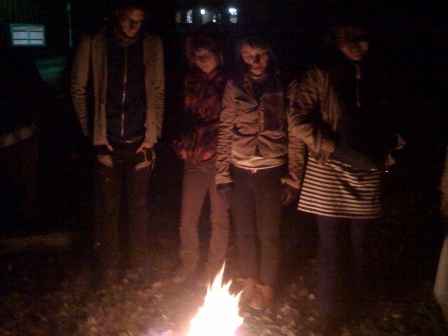 Mary and Sam also opened their home and hearts – they surprised P, EJ, Tone, Brady, Zach, Chase, Megan, Katie and Katie Face with a bon fire, the chance to roast hot dogs and eat lots of homemade pie. I couldn’t be there for the farm visit, but as I write this post I am reminded about how lucky I am to be the owner of Tazza D’Oro. Our baristas rise to the occasion every time I put a challenge out there for them – they went to the farm, milked the cows, engaged with the farmers and came home with an awesome experience and appreciation. Mary and Sam, thank you so very much and we appreciate all your hard work and exceptional quality. The same goes for Turner Dairy and the Turner family. 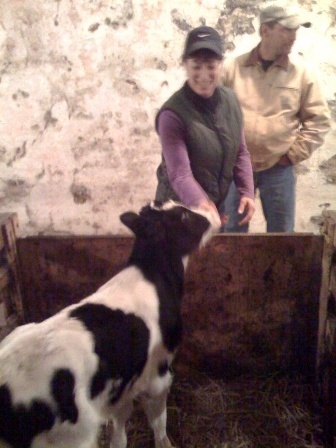 BTW, our baristas had the chance to meet two new calves that happened to be born the same day as their visit. Whoa moment and hope we get to name one! This is how we serve Mary, Sam and Turner’s incredible milk. Gee, I should have titled this blog post “Full Circle”! Fan-f'n-tastic!!!!!!!! 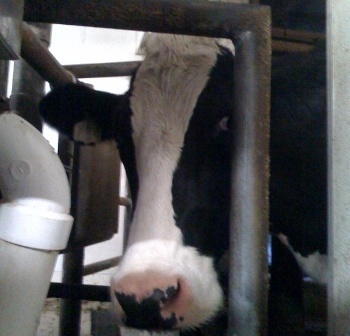 Now we get to the real reason the milk over there is perfect - you have a personal relationship with the COWS! Rich- MOOOO! Your call today did make me wonder the same thing. Maybe a visit to the farm from Aldo Coffee is due? I can't thank Mary and Sam enough for the incredible experience we had last night. Every latte and cappucino I made today, I thought of them, the cows, turner dairy and all the hard work that goes into each cup of coffee we make at Tazza D'oro. Thanks to our great coffee roaster I already knew about the amazing coffee, but last night put it all together. 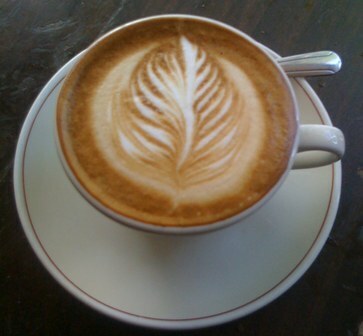 It takes a lot of work from so many people to make a great latte, and now I can truly appreciate every last drop. ps. now I really want a cow. Can we get one, Amy Sue? we can name her Bessie Sue! I must admit, the picture of the cow is pretty damn cute and it would be a great JOB for Frankie - Wheaten Terrier and the farm thing - YEAH! btw, loved meeting all the "ladies" at the farm. my favorite part was when the calf licked my hand. i swore i would never wash my hand again. it was a beautiful night and a great experience that i wont soon forget. thanks mary, sam and brett for showing us a good time and answering all of our questions. I'm a little late but I just want to say how awesome it was of Mary, Sam, and Brett to take the time to show us around and fill our bellies with homemade pie and hot cocoa. Seeing where the "Ladies" live and hearing little details about their personalities was so great.